7th CPC : Revision of Pension for Pre-2016 Diability/Family Pensioners with notional pay fixation in the pay matrix under CCS(EOP) Rules, No.1/4/2016-P&PW (F), Government of India, Ministry of Personnel, Public Grievances & Pensions, Department of Pension & Pensioners’ Welfare, 3rd Floor, Lok Nayak Bhavan, Khan Market, New Delhi-11 0003. Dated the 12th October, 2017. 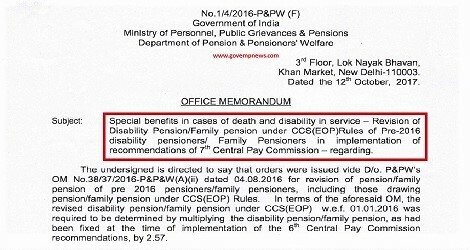 OFFICE MEMORANDUM, Subject: Special benefits in cases of death and disability in service – Revision of Disability Pension/Family pension under CCS(EOP) Rules of Pre-2016 disability pensioners / Family Pensioners in implementation of recommendations of 7th Central Pay Commission – regarding. The undersigned is directed to say that orders were issued vide D/o. P&PW’s OM No.38/37/2016-P&P&W(A)(ii) dated 04.08.2016 for revision of pension/family pension of pre-2016 pensioners/family pensioners, including those drawing pension/family pension under CCS(EOP) Rules. In terms of the aforesaid OM, the revised disability pension/family pension under CCS(EOP) w.e.f. 01.01.2016 was required to be determined by multiplying the disability pension/family pension, as had been fixed at the time of implementation of the 6th Central Pay Commission recommendations, by 2.57.